Northampton Community Television executive director P. Al Williams has reason to feel good about his most recent hire. Jeromie Whalen, who paid his dues as an NCTV intern before getting the thumbs up for full-time employment, helped bring the station some national accolades over the summer. The Hometown Award is an annual honor from the Alliance for Community Media—a roughly 800-member organization made up of community TV stations from across the U.S.—and was taken home this year by Whalen’s winning documentary, Purgatory: A Historical Analysis of the Belchertown State Schools. The award not only garnered praise for Williams (and gave him an excuse to visit the Southwest), but also gives additional exposure to the documentary, the issues addressed in it and the Pioneer Valley in general. Whalen sits at his newly acquired desk as his boss shows me around the studios, a multi-room suite tucked away in the rear of Northampton High School that seems much bigger inside than you would suspect from its unremarkable exterior. There is a fair amount of technology in the place, from the big room with live-feed cameras and lights to the main control room that houses a wide range of equipment (standard-def stuff that was donated by an area NBC associate after the 2004 Olympic Games in Athens) to a couple of modest editing suites with computers and line mixers. There are also a green screen, several HD digital field cameras, and mounts for cars, bikes and human heads as well as waterproof housings for underwater shots. Williams notes that the main control room is being dedicated to Teri Morris, a longtime former NCTV presence and drummer for the local rock band Tizzy, who passed away prematurely at age 41 from cancer. Morris oversaw the station at its old location on Bradford Street and was involved on some level with many citizens’ creative projects in the 1990s and early 2000s. “We’re [currently] not a government entity and we’re not a cable company—we’re a completely independent nonprofit. We’re really a subcontractor; we run the community media center for the city, and the funding comes as a result of federal law. The city can negotiate with whoever the cable provider is—in Northampton there’s only one cable provider [Comcast], as is the case in pretty much all of Western Mass. In eastern Mass. there are more providers. This formula for successful funding doesn’t necessarily work well in sparsely populated towns; in low-density communities like Plainfield, there just may not be enough cable revenue for a town to take a bite out of that amounts to meaningful capital. But, Williams tells me—perhaps because of a dearth of knowledgeable advocates like himself or Morris—many more densely populated cities and towns are simply unaware of their rights under these provisions and may wind up essentially bullied out of them as a result of their ignorance. Much of the teaching done at the station comes in the form of internships that are directly arranged through the high school, where students can sign up to learn production and editing techniques. There are also a lot of people from the community who sign up for classes, a process that seems to work pretty much on a sliding scale. The digital video editing program Final Cut Pro is what’s primarily taught in classes, but NCTV is slowly expanding its mandate to include programs like Photoshop and Flash. Video editing is, necessarily, taught on a one-on-one basis, because the station only has two edit suites. There are also things students can learn that move a little faster than the often snail-paced activity of editing, and some people seem to fall more naturally into this faster-paced environment. “We also teach people to direct live television from a control room,” Williams continues as we enter the main “live” room. “One of our interns from last spring [Emily Crescitelli] just started at Marist College, where they run a campus television show—she’s going into television production. She talked with her advisor, and, based on what she learned with us—and freshman aren’t even usually allowed into this program—I think she’s going to be directing the program, and maybe running it next year.” Take heed, NHS seniors; a semester at NCTV could put you on the fast track to Hollywood. NCTV covers a lot of typical community issues—mayoral debates, local weather when it gets out of hand, and the annual Transperformance music benefit at Look Park. Some would-be producers create local news programs or talk shows, or endeavor to stitch together ambitious documentaries digitally, bit by bit. Some who’ve been bitten hard by the bug even strive to produce shows that air regularly. I mention that one of my 17 simmering, back-burner creative ideas is to produce a show that reviews action movies, and he recalls a similar “review” show from the annals of NCTV’s past with a bit of a chuckle. Looking forward, Williams wants to engage the community in a number of ways, not just through television production. 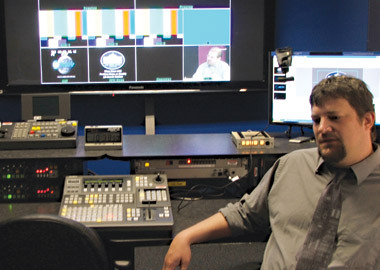 As tuitions for communications schools like Emerson College or the Connecticut School of Broadcasting continue to rise, well-equipped learning facilities like NCTV become an ever more appealing alternative for those seeking a vocational leg up in a media career. For aspiring young producers on shoestring budgets, the station is a resource that Northampton is lucky to have. For other communities that are arguably starving for something as inspiring, productive and educational as NCTV has put together, the hope remains that strong negotiators like Morris and Williams will step up and help them to get what they’re entitled to.